Day Trip to Kincardine Lighthouse, Cheese Factory Tour, Lunch & Mennonite Buffet Dinner Included! 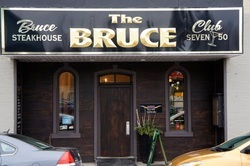 Lunch at Bruce Steakhouse in downtown Kincardine. Vegetarian and gluten free options will be available. Free time to explore the Kincardine Lighthouse, marina and the famous Harbour Street and Queen Street in downtown Kincardine. A Mennonite style dinner buffet at the Crossroads Restaurant in Elmira, Ontario, in the heart of Mennonite country. This is a large buffet and vegetarian options will be available. $120 per person all taxes and tips included. Wow.... here's another very interesting and educational day trip in store for you. Today we are off to the beautiful small town of Kincardine, Ontario. Kincardine is about two & a half hours northwest of Toronto on the shores of Lake Huron in the Bruce Peninsula. Although Kincardine is famous for it's sunsets and it's Scottish heritage, it's most famous landmark is the Kincardine lighthouse. We will be visiting the lighthouse and the marina to allow you to take some lovely pictures of this historic landmark. Built into the bank of the Penetangore River in 1881, the Kincardine lighthouse is the only ‘downtown’ lighthouse on the Bruce Coast. It stands 24.4 metres (74 feet) tall, and is built above a two-story light keeper’s house. In 1922, the lamp became electrically powered and, today, large lenses rotate around a 500-watt bulb. We start off our day by going to downtown Kincardine for our group lunch at the Bruce Steakhouse. Established in 1853 the business has continued in the tradition of offering a family atmosphere, succulent food and the best lakeview patio on Lake Huron. Vegetarian and gluten free options will be available. Cost of lunch, tax & tips is included in the tour price. 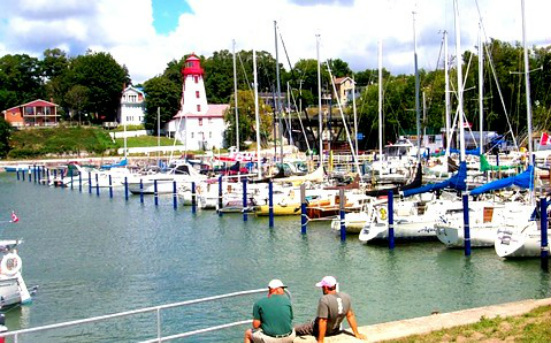 After lunch you will have the opportunity to wander the marina and the lighthouse as well as visit some of the quaint stores in downtown Kincardine. Please note that the lighthouse will be closed during our visit (it is only open July 1 to Labour Day) so you will not be able to climb the steps to the top but you will be able to take lots of photos from the outside. Our next stop is going to be a wonderful visit to the Pine River Cheese & Butter Co-Operative in Ripley, Ontario, just a few minutes drive from Kincardine. Pine River Cheese, a farmer-owned co-operative, was established in 1885 in Huron Township on the banks of the Pine River. The original purpose of the company was to manufacture and sell cheese and butter, and to buy, keep, fatten, and sell hogs. The present day company is concerned primarily with the manufacturing and sale of cheese. Today, Pine River Cheese manufactures and sells over 2.25 million lbs. of cheese, annually and employs 40-45 full and part time employees. Due to health regulations visitors are not allowed inside the production area. However there is a large viewing gallery that overlooks the production floor. We will start with a visit to the viewing gallery where you will be see the production floor, get a brief presentation from the cheese expert that will be provided by the company and watch a film on cheese manufacturing as well as look at some production artifacts in their cheese museum. Following the visit to the viewing gallery, you will have an opportunity to sample lots of cheese and visit the the retail store, featuring, of course, all varieties of Pine River cheese. These include mild, medium, old and premium cheddar, mozzarella, havarti, marble and flavoured cheeses. The store also carries certain varieties of organic cheeses and gourmet items to tempt any palate - speciality coffees, cocoa and hot chocolate in a variety of flavours, imported chocolate and other candy, imported biscuits, a wide variety of crackers, jams, jellies and other preserves, pickles, olives, and so on. Please note that the cheese factory is in production on weekdays only. Since we will be visiting on a Saturday, there will be no actual production happening in the plant during our visit. After our stop at Pine River Cheese, we will make our way back to Toronto and along the way, stop in Elmira, Ontario, in the heart of Mennonite country. We will be stopping at the Crossroads Restaurant to enjoy our homestyle buffet experience. Crossroads is famous for their Mennonite homestyle buffets and there will be lots for everyone to eat including vegetarian options. The cost of the dinner, tax and tip is included in the tour price. And that's it.... after we waddle waddle our way out of the restaurant, we will make our way back on to the bus and drive back to Toronto. All in all, it should be a wonderful day!